TORONTO, ONTARIO--(Marketwire - Feb. 6, 2012) - Allana Potash Corp. (TSX:AAA)(OTCQX:ALLRF) ("Allana" or the "Company") is pleased to announce that it has intersected two zones of strong potash mineralization in both Hole DK-11-29 ("Hole 29") and Hole DK-11-31 ("Hole 31). Hole 29 is located in the western portion of the concession block and was targeted to test potash mineralization west of Hole 9. 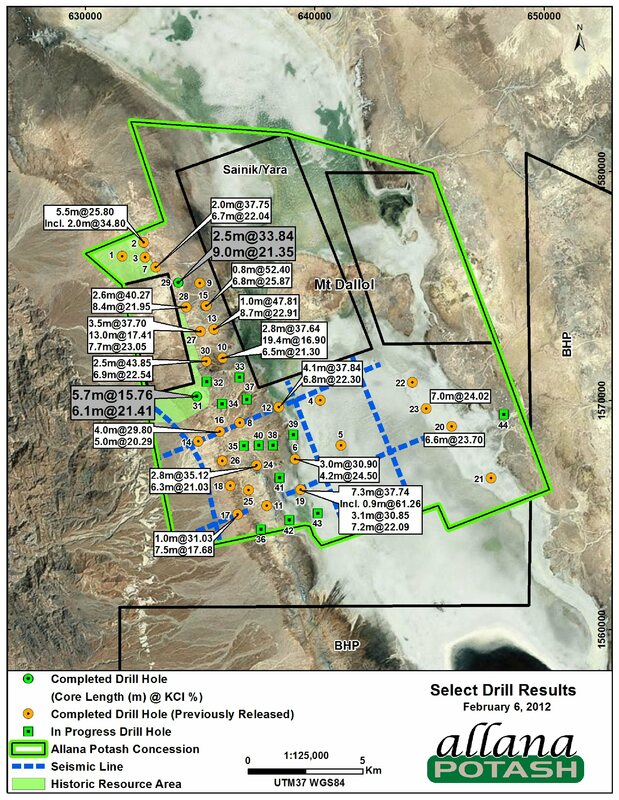 Hole 29 intersected a strong Sylvinite Zone at a depth of 124.50 metres which yielded 20.51% KCl over 6.80 metres including a high grade section of 2.5 meters of 33.84% KCl from 124.50 metres to 127.00 metres. The Kainitite Zone was also intersected deeper in the hole at a depth of 227.30 metres and returned 21.35% KCl over 9.00 metres. Hole 31 is located at the central-west portion of the project area approximately 1200 metres north of Hole 16 and was positioned to target the extension of the Musley deposit south of the historic drilling by Parsons. The Sylvinite Zone returned 18% KCl over 1.70 metres starting at a depth of 73.50 metres and the Kainitite Zone yielded 21.41% KCl over 6.10 metres starting at a depth of 82.30 metres. Farhad Abasov, President and CEO, commented: "Allana continues to be encouraged by the continuity and strength of potash mineralization in the western portion of the property as exhibited by the results of Holes 29 and 31. This area continues to yield high grade potash in the Sylvinite and Kainitite zones which management believes will allow Allana to upgrade mineral resources from Inferred to Measured and Indicated categories as well as add to the Inferred category. The relatively shallow and high grade nature of the Sylvinite Zone make this area ideal for solution mining with recovery through solar evaporation. Pilot studies for the Feasibility Study are well underway and Allana has made significant progress on road, port and rail infrastructure planning." Hole 29 was drilled vertically and was collared approximately 1000 metres west of Hole 9 (see attached figure). Hole 29 is located in the western part of the concession block 10 and east of the historic Musley Deposit suggesting that potash mineralization at Musley continues and is consistent at least to Hole 9. Previously released Allana drill holes in this region yielded high sylvinite grades (see attached figure) and the results of Hole 29 further support the interpretation of the extension of potash throughout the region. Hole 31 was drilled vertically and is located approximately 1200 metres north of Hole 16 (see attached figure). The presence of sylvinite and kainitite in this region suggest the continuity of the potash mineralization extends south from the Musley Deposit as defined by the Parsons work and towards Hole 16 and Hole 8. Exploration drilling has shifted to the far eastern part of the property (Hole 44) as part of the resource expansion drilling program that management has designed to add mineral resources. Samples from holes 32-43 are undergoing analysis or are en route to the laboratory in Saskatoon, Canada. In addition to exploration drilling Allana has completed two geotechnical holes to provide large diameter core for rock mechanic testwork. Two holes remain to be completed in the geotechnical drilling program. Pilot evaporation pond testwork, hydrogeological studies and solution mining testwork are underway as the Company's Feasibility Study advances. Heavy machinery to construct the ponds is on site and engineering work and earthworks are in progress. Highway construction by Ethiopian government contractors is actively proceeding to connect the project area with industrial quality, paved roads both to the Company's project development staging facilities in Mekele and to the southern highway access to ports in Djibouti. Discussions are progressing with government departments and private sector operators regarding expansions of existing port operations and development of new port and rail facilities that would be available with sufficient capacity to serve the project. The Company continues to expect that the infrastructure required to begin and ramp-up operations will be in place concurrently with or in advance of the Company's project construction period. Operations expansions in the project area continue to be well-served by immediately available water supplies and on-site electrical generators. Current geotechnical, hydrogeological and environmental survey work is defining locations and capacities for water sources and results will be integrated with the feasibility study. Allana is a publicly traded corporation with a focus on the acquisition and development of potash assets internationally with its major focus on a previously explored potash property in Ethiopia. Allana has secured financial support from two significant strategic investors: IFC, a member of World Bank Group, and Liberty Metals and Mining, a member of Liberty Mutual Group. Allana has Measured and Indicated Sylvinite Resources of 97.8 Million Tonnes of 30.0% KCl; Inferred Sylvinite Resource of 108.3 Million tonnes grading 31.3% KCl; Measured and Indicated Kainitite Resources of 284.2 Million tonnes at 19.8% KCl, Inferred Kainitite Resource of 271.2 Million Tonnes of 20.3% KCl; Measured and Indicated Upper Carnallitite Resources of 78.5 Million Tonnes grading 18.4% KCl, Inferred Upper Carnallitite Resource of 85.6 Million Tonnes of 17.1% KCl; Measured and Indicated Lower Carnallitite Resources of 212.6 Million Tonnes of 12.0% KCl, Inferred Lower Carnallitite Resource of 130.7 Million Tonnes grading 11.7% KCl. The foregoing mineral resource estimates are as at June 13, 2011 and are set out in the Company's NI 43-101 compliant Technical Report entitled "Resource Report for the Danakhil Potash Deposit, Afar State/Ethiopia" dated June 24, 2011 filed on SEDAR. Allana has approximately 222,607,557 million shares outstanding and trades on the Toronto Stock Exchange under the symbol "AAA". Allana is utilizing SRC's Potash ICP Analysis package designed for multi-element analysis of potash samples. Upon arrival at SRC Geoanalytical Laboratories, core samples are jaw crushed to 60 % @ -2mm and 100 g sub sample is split out using a riffler and transferred to vials. The subsample is pulverized to 90 % @ -106 microns using a puck and ring grinding mill to create a pulp. The grinding mills are cleaned between groups using Quintus quartz. The pulp is then transferred to a labelled plastic snap top vial. An aliquot of pulp is placed in a test-tube with 15 ml of 30°C DI water. The sample is shaken. The soluble solution is then analyzed by ICP-OES. The method is suitable for the soluble analysis of commercial potash (Sylvite). The soluble solution is then analysed by ICP-MS. In addition, samples are analysed for FeO (wt%), Br and Cl by MS, plus insolubles. SRC Geoanalytical Laboratories has been certified by the Standards Council of Canada (SCC) to conform to the requirements of ISO/IEC 17025:2005 (CAN-P-4E). To view the map associated with this press release, please visit the following link: http://media3.marketwire.com/docs/AAADrillResults_Feb6.jpg.